But this time state media said he was “speechless” a power plant was only 70% complete and “appalled” by hot-spring bathtubs “dirtier than fish tanks”. Pyongyang has long pushed for economic progress as the secondary aim alongside developing nuclear arms. 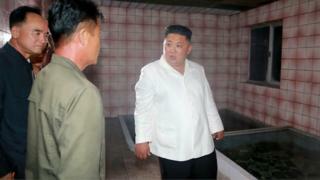 Mr Kim’s latest inspection tour took him to four sites in North Hamgyong province, bordering China. At Orangchon power station, he complained that only 70% of the facility had been completed, 17 years after construction began. At a hotel in the city of Yombunjin, he noted that six years into the construction project, plastering was still not finished. Visiting the Onpho holiday resort, he pointed out bathtubs that were “dirty, gloomy and unsanitary”, state-run KCNA news agency reported. After visiting a bag factory, he said the provincial party committee was “working in a perfunctory manner”. Now that he’s declared the nuclear programme complete, he is trying to show North Koreans that he’s making good on his economic pledge. He is also shifting any blame for the failure to complete the projects on to local party officials, rather than his leadership. North Korea’s domestic newspaper Rodong Sinmun devoted a whole nine pages to the story. “Normally such things are not done in the open press which, in the overwhelming majority of cases, maintains the image of the DPRK [North Korea] as a perfect country,” analyst Fyodor Tertitskiy of NK News told the BBC. There was no escape for the officials involved later in the day either, with state television’s main evening news extended from its usual 20 minutes to a full hour to accommodate reports on Mr Kim’s inspection visits and his fury at performance. Senior news reader Ri Chun-hee was among Central TV’s team of four announcers who took turns to read KCNA scripts saying that officials had “no revolutionary spirit”, the strongest words aimed at senior officials on national media since weather forecasters were publicly chided for their poor performance in 2014. In a move perhaps designed to heap shame on the officials, the hour before the main news had carried a compilation of Mr Kim’s successful inspection tours over previous years.